The old saying that, “what’s old is new again in the fashion world” is a recent trend that sports teams seem to be following. Many professional teams are bringing back classic looks, or combining old and new aspects of team’s uniforms. Sometimes it’s for history while other times it’s to appease the fan base. Either way in the NFL, many teams such as the Bills, Vikings, and 49ers have followed this trend in the past few seasons with much success and fan approval. However, there are still a few teams who should strongly consider bringing back their classic jerseys and logos those fans would love to see again full-time. So ugly they’re beautiful! They do say beauty is in the eye of the beholder. While many Tampa fans associate this jersey with the club’s painful early days, including losing their first 26 games, since they have become throwbacks there has been an outcry to bring these jerseys back full-time. While I think these jerseys would look better with the new flag logo on the helmet instead of the winking pirate, without question the colors are what make the Buccaneers stand out. With so many teams having red and black color schemes already, why not go to a look nobody else has? Hey it may be different but these uniforms are clean, colorfully, and defiantly catch your eyes on television. 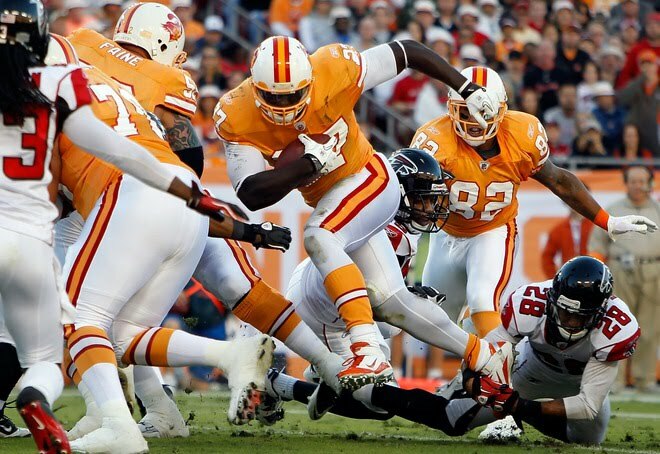 If the Bucs ever went back to these full-time they would defiantly be making a statement with these bad boys. I say bring on the creamsicles!! Ok, so we all know that the word “Redskin” is offensive to Native Americans. We also know that the Redskins ownership has made it abundantly clear that they aren’t going to drop the “Redskins” namesake. What to do? How about a compromise? The Redskins can keep they’re name but have to drop the offensive Redskin mascot with the Indian chief head. But what will they wear? How about these beauties from the 60s. This jersey keeps the iconic colors but has the intimidating spear decals along the shoulders and on the helmet. Hey, defenses may get cower in fear if they see the RGIII arrow whizz right by them for another Redskins’ touchdown. Look, I think the Redskins are in a difficult situation right now, but with this uniform change it may help reduce the insensitive nature of the Redskins nickname. I see it as a win for everybody. The Redskins look great and intimidating, the ownership can keep the name, and Native Americans no longer have to see the insensitive mascot on the side of the helmet. Dear NFL, if you are reading this you should look into this solution. Not to say I don’t like the Eagles current uniforms, but their classic kelly greens are a better option, in my opinion. The current jerseys have too much going on with the black, white, silver, dark green, and white. The Simple Kelly green and silver was both simple and elegant. Listen the eagles don’t even have to change their logo, just the colors and the jerseys. These uniforms have so much history and make you think of the legendary Eagles, such as Reggie White, that used to wear them. While I don’t see them going back to these full-time, I think a lot of Philly fans would like to see these babies full-time once again. The Kelly green is a great combination that the Eagles had and gave them a great look back in the day. Robert Kraft, please bring these back! No jerseys scream patriotism louder than these classics. The red, white, and blue is well-balanced while the white helmets with their red, and blue stripes really pop. But what makes this uniform is the mascot. Nothing screams football like an American patriot in a three-point stance about the hike a football. Why should these be brought back? They’re leaps and bounds better than the Patriots current threads. Blue and silver? Not as patriotic as red, white, and blue. Silver helmet with a red face mask? Yawn. But the worst offense is the new mascot. A patriot head the looks like a bad Elvis? Really? This was better than Pat the Patriot? Do I want the intimidating PAt the Patriot looking to knock me over of the Patriot head with the bad hairdo?I think you know the answer to that one. 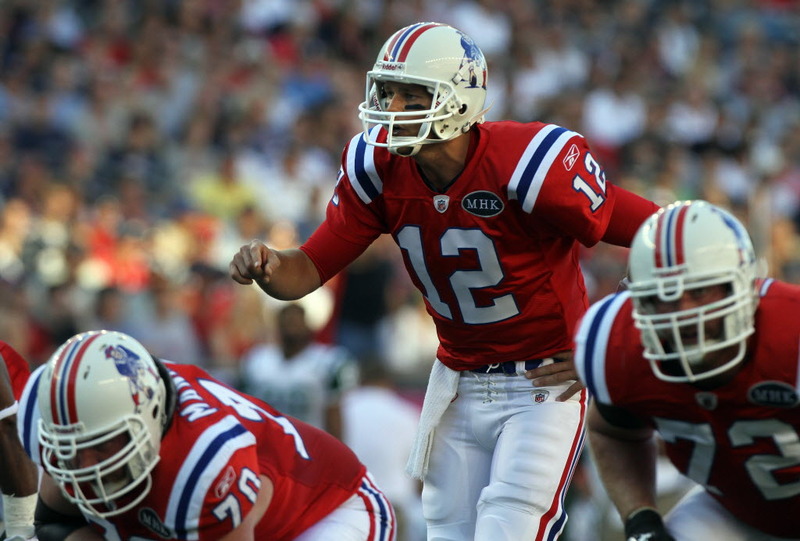 Come on New England you’re the Patriots, you should bring back the jerseys that actually make you look like Patriots. In 1974, one of the greatest tragedies in sports occurred. 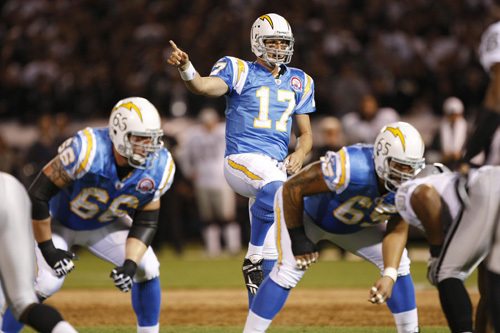 The San Diego Chargers got rid of their powder blue jerseys as their primary jerseys. Why the Chargers got rid of, and to this day continue to, not wear their powder blue jerseys is one of the greatest mysteries in sports. The powder blue represents the city of San Diego perfectly as a city that is sunny and just goes with the flow. The lighting bolt that represents speed and those white helmets with the numbers on the side were so cool. Sure they do wear the powder blues from time to time and even have an updated version and have added elements of the originally jerseys into their current uniform set. But why not the real thing? The fans don’t deserve a substitute give them what they want! Heck if I was the Chargers I would ask the NFL if I could have my team wear these jerseys every game. So many people love these uniforms, they’re one of the greatest uniforms ever created in the history of sport. Bring back the powder blues now! 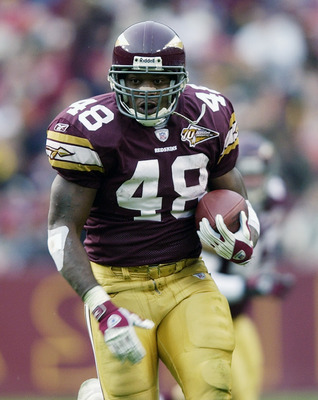 Check out our poll and vote on the jerseys you want back in the NFL. Don’t forget to comment and follow! Previous The ones who didn’t get away : SMU college football’s greatest mistake. Next Crossroads: What will Happen to Tim Tebow? I love the article! Bring back the old uniforms.